A wristwatch and pocket watch in ONE - by DR.W. | DR.W. A wristwatch and pocket watch in ONE – by DR.W. Starting with this heading, our Kickstarter project became a big success. As you might know, we passed our funding goal already within 17 hours, and ended at a beautiful amount of €36.770 raised (this is 184% versus our €20.000 funding goal). This means that we sold 152 watches! 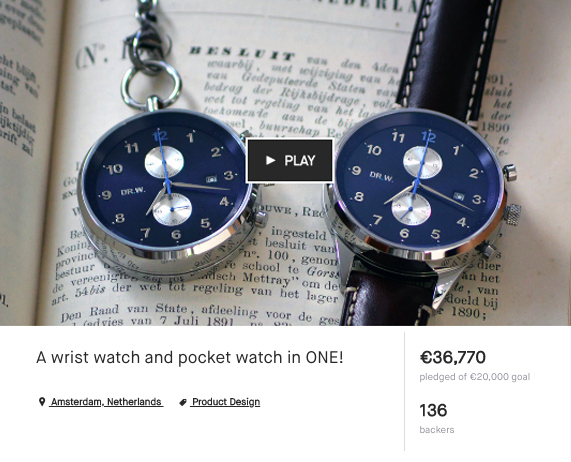 People from all over the world bought our watches, we sold them in 23 different countries. We received a great deal of support from our friends and family, something that we really needed and appreciated in order to ‘kickstart’ our campaign. Next to these supporters, a lot of people unrelated to us ordered a watch. Also this feels very special, all these people that will be wearing a DR.W. watch because they like the watch and/or the concept: a watch that you can change from wristwatch to pocket watch -and reverse- with just a twist and a click. Thank you so much! All the time, work, effort and joy we put into it has paid off and made it possible for us to order the first batch! Many of these DR.W. watches will be around the wrists and in the pockets of our backers in October or November of this year. Already from the very start of our campaign, a lot has happened. We got approached by tons of companies and people. Our parents did raise us with the value to be polite. We tried to answer every single one of them. Well, that didn’t last long… it was simply way too much and therefore impossible. Therefore, questions from backers, interested people and everyone that showed interest in our product got all our focus, and we hope and think we didn’t leave any of those unanswered. If we did, please give us a shout! We raised the necessary funds to bring the first DR.W. model Jurre to life, so the next step was placing the order. When we received most of the surveys and knew the majority of preferences in terms of dial colors and straps, we directly proceeded with ordering all the materials in order to get the watch as quickly as possible to you. Currently, our watch is in the last month of its production. After that, a quality control and laboratory tests will be conducted to make sure the watches are in line with the high pre-agreed standards. This will take about two weeks, a serious matter: excellent quality is something we want to stand for, so this is an essential part of the production process of a real DR.W. Straps, cords, chains, travel pouches and manuals are either finished or soon to be finished. All in all, we are well on track to deliver on time (late October/start November). Currently our webshop is almost ready to receive orders. Thanks to Roana, who has spent hours and hours to create a ‘picture perfect’ webshop and ensures everything works well, thanks Roana! In the meantime, we already received quite some orders via e-mail. 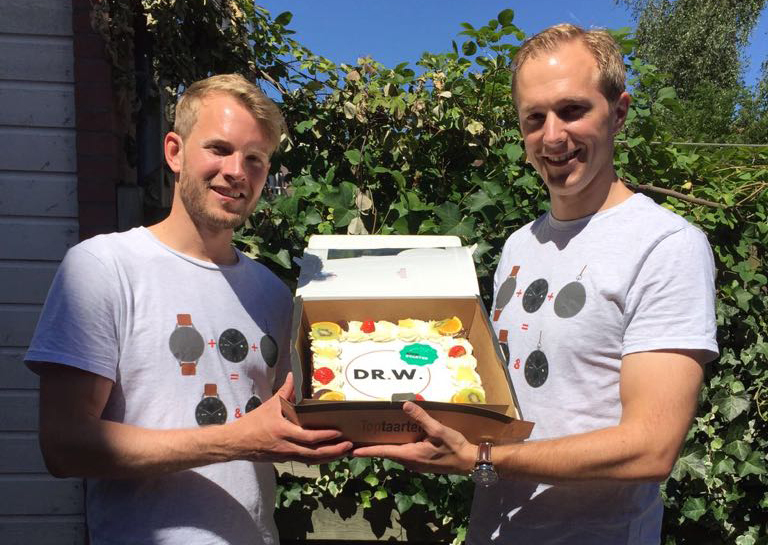 After we delivered the products to our Kickstarter backers, we are ready to deliver the DR.W. watch to the rest of the world :-). Of course, that is not the only thing we are busy with. We are designing a new model which is slightly smaller and thinner, logically more directed toward our female supporters but also towards guys who like a small minimalistic watch. This watch will also come with the twist & click mechanism so you will be able to use the watch in multiple ways. Soon more news on this watch, but to manage expectations: we hope to order the first prototypes in September or October. So, in the very best case, we might have a prototype by the end of this year. If not, in the first quarter of 2019. We are very excited and grateful for everything we have accomplished so far. It has given us tons of joy, lessons and hours of work. We strive to make DR.W. a healthy watch brand with a little twist, step by step. We have taken the first steps and we like the trail so far, so we will continue our walk! https://www.drwbrand.com/wp-content/uploads/2018/06/Web-N003-DR.W.-Model-Jurre-Wrist-Pocket-Navy-Silver-1.jpg 900 1200 DR.W. https://www.drwbrand.com/wp-content/uploads/2018/05/Logo-DR.W.-Left.png DR.W.2018-09-02 10:47:332018-09-02 11:06:32A wristwatch and pocket watch in ONE - by DR.W.